Having an audience for your prose, whether it’s a short story or a novel extract, is a great way to build up a loyal following as well as get a sense of the story you’re telling. The session of Novel Nights on 25th October is part of Bristol Festival of Literature 2017, making it a really prestigious event on Bristol’s lit scene. There are three slots of five-minutes for writers, and I’m helping to select the stories, so why not submit? Closing date for submissions is 1st October 2017. 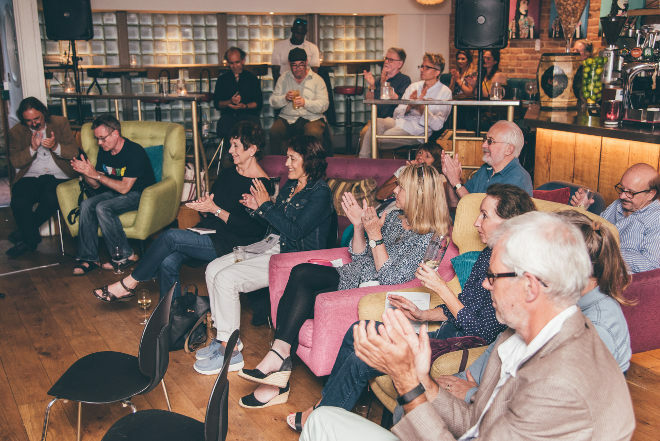 The audience are a group of friendly writers and readers, so you’re bound to come away with a buzz. We look for strong, well-crafted writing that will delight and excite an audience. We choose extracts that fit in with the theme of the night or that fit with each other. If you are not chosen it doesn’t mean we think you are not good enough! These things are subjective. Find out more at www.novelnights.co.uk/submissions-for-novel-nights. This entry was posted in News and tagged Bristol Festival of Literature, Novel Nights, opportunities for writers by Judy. Bookmark the permalink.